Right now my witchdoctor is pretty much finished the game, except for a few Aquila side quests. My Privateer is still level 27 and in Cool Ranch. I did quest enough on her to make one post, which will be up soon. My swashbuckler (the one I am leveling with my daughter) is currently on hold until we get her set up with a different computer. That is in the works, so you will be seeing more Autumn and Chloe posts again in the near future. So what have I been up to in game you ask? Well besides the contests and events I have been hosting, I have also made 2 new characters! And guess what their names are.....That's right! Autumn Walker and Autumn Walker! First I will introduce you to my Musketeer. 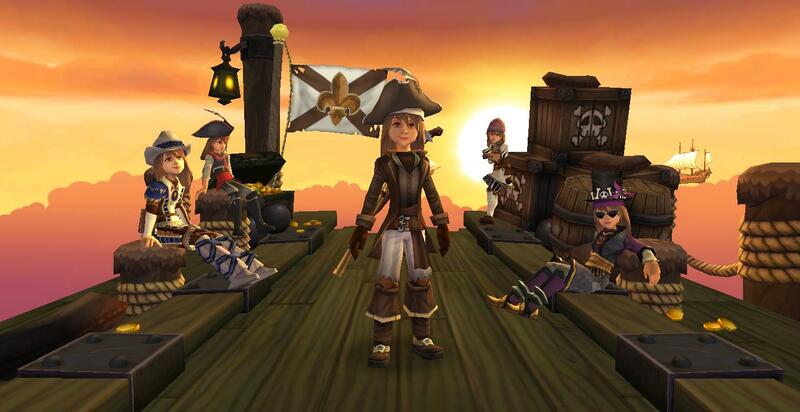 I actually created my musketeer when Pirate101 went live. I got her to level 5 before I decided to focus on my witchdoctor. So when Edward Lifegem made a musketeer and mentioned maybe leveling a character with me, I had her ready made! We have quested up to level 8 and just got our Presidio companions and new ships. Next up is meeting One Eyed Jack! Since Ed and I have to coordinate our schedules, I'm not sure when I will be leveling on here again, but I hope it's soon. The musketeer class is fun! The last Autumn Walker is a buccaneer. Even though I haven't had too much time for questing, she is already level 13 and nautical level 12. I am about to do the dungeon to get the monkey's paw, so almost done with Monquista! So far I haven't found this class too difficult, but I have died a couple times, so we'll see. I probably wont be blogging about my questing on these 2 characters much, but I did want to introduce you to them. I may make an occasional post if something cool happens, and they may pop up in other posts about game updates and events and such.